Add punch, excitement and interest to your stage presentation with Sensational Answers . The truly outstanding mentalist must add a few outstanding and long-remembered situations in every program to give it balance, create dramatic tension and palpable relief. The run-of-the-mill questions and answers rightfully constitute the bulk of every psychic entertainer's program, but it is the out-of-the-ordinary, the daring and sensational situations that are the ones your audience remembers and talks about. For a dynamic, sensational program, you must use dynamic and sensational material. Included in this ebook is vital information on how to call the husband or wife by his or her first name, provide addresses, vocational pursuits, places of employment, etc. - though not told to anyone or written down. Super-sensational, easy to obtain data that will skyrocket the performer's path to fame and fortune. Nelson furnishes an abundance of new, vibrant and punch-laden sensational answers. 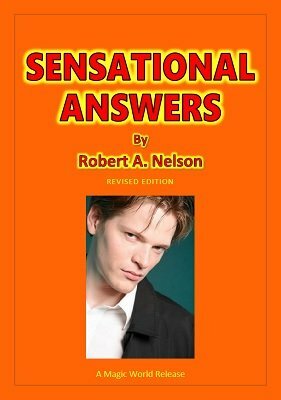 There are over 100 answers included, drawn deep from his years of stage, radio, and TV appearances for this unique material. Any one situation will improve most any psychic entertainer's act. Here is escape from the ordinary, and material that will create a "buzz" of excitement that will get you noticed! Are you a Nelson collector? This was Item Number 73 in the Nelson Enterprises catalog . Now you can fill that missing spot in your collection. 1st edition 1953, PDF 69 pages.